We’ve been over the numerous BS excuses that US Dollar destroyer extraordinaire Ben Bernanke has made for QE enough times that today I’d rather simply focus on the REAL reason he continues to funnel TRILLIONS of Dollars into the Wall Street Banks. I’ve written this analysis before. But given the enormity of what it entails, it’s worth repeating. The following paragraphs are the REAL reason Bernanke does what he does no matter what any other media outlet, book, investment expert, or guru tell you. 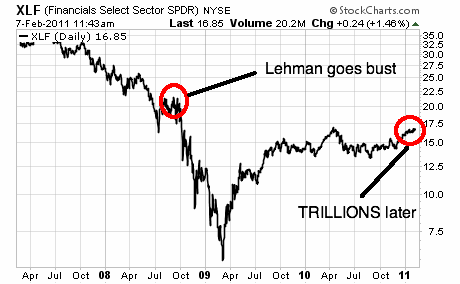 Bernanke is printing money and funneling it into the Wall Street banks for one reason and one reason only. That reason is: DERIVATIVES. Five banks account for 95% of this. Can you guess which five? Looks a lot like a list of the banks that Ben Bernanke has focused on bailing out/ backstopping/ funneling cash since the Financial Crisis began, doesn’t it? When you consider the insane level of risk exposure here, you can see why the TRILLIONS he’s funneled into these institutions has failed to bring them even to pre-Lehman bankruptcy levels. Ben Bernanke is a stooge and a fraud, but he is at least partially honest in his explanations of why he wants to keep printing money. The reason is to try to keep interest rates low. Granted, he’s failing miserably at this, but at least he understands the goal. Put another way, Bank of America (BAC), JP Morgan (JPM), Goldman (GS), and Citibank (C) would CEASE to exist. If you think that I’m making this up or that Bernanke doesn’t know about this, consider that his predecessor, Alan Greenspan, knew as early as 1999 that the derivative market, if forced into the open and through a public clearing house, would “implode” the market. This is DOCUMENTED. And you better believe Greenspan told Bernanke this. In this light, all of Bernanke’s monetary policies and efforts are focused on doing one thing and one thing only: trying to shore up the overleveraged, derivative-riddled balance sheets of the Too Big to Fails, or Too Bloated to Exist, as I like to call them. The fact that the bank executives taking this money and using it to pay themselves and their employees record bonuses only confirms that these folks have NO interest in taking care of shareholders or their businesses. They’re just going to take the money and run for as long as this scheme works. I don’t know when this will come unraveled. But it WILL. 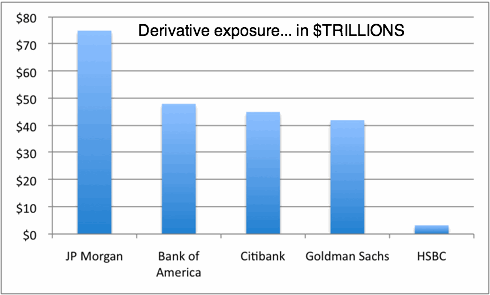 At some point the $600+ TRILLION behemoth that is the derivatives market will implode again. When it does, no amount of money printing will save the Too Bloated To Exist banks’ balance sheets. At that point, it’s game over for Wall Street and the Fed.